With Mr. Katsanos’ generous assistance, we coded the Aussie strategy to the article’s specifications in WealthScript. During the process, we discovered that the secondary symbol data had missing bars with respect to the primary symbol, AUDUSD. Wealth-Lab gives you the ability to control synchronization such that indicators based on secondary symbols should generally be created using the raw data before synchronizing the resulting data series with the chart. The code reflects this delayed synch approach. Separately, it’s important to note that indicators such as MACD and EMA require a fair amount of seed data (more than 100 bars for MACD) to stabilize their calculation before they can be used reliably for backtesting or trading. Even though the strategy ignores the first 100 bars, the initial trades can still be sensitive to the length of the seed data. Figure 1. 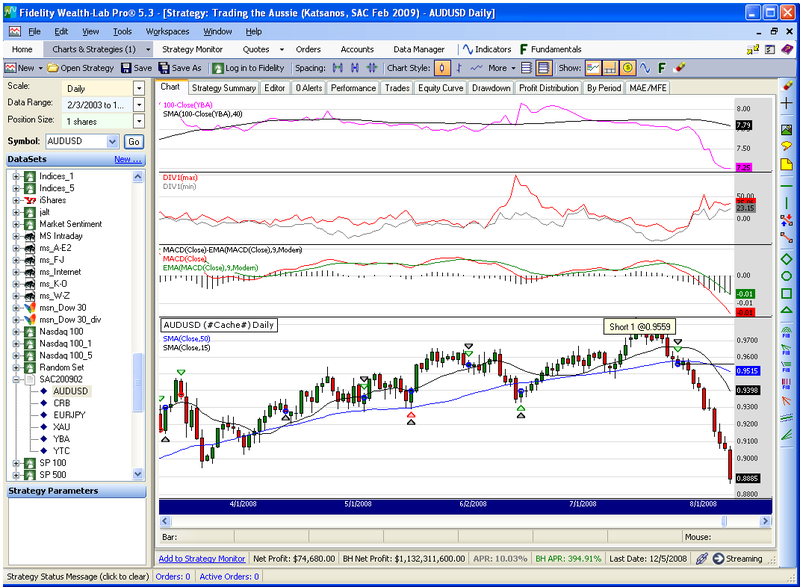 The strategy presciently reversed near the top and held the Aussie short from July - Dec 2008. Download the attachment for the ASCII Data used for the article and the Strategy below. (Attachments are available only to registered Wealth-Lab Pro/Developer customers). If using your own data, be sure to make the secondary symbol changes in the code as required. && C > (1 + pct) * HH4[bar];  // should it be LL4 as in Buy?